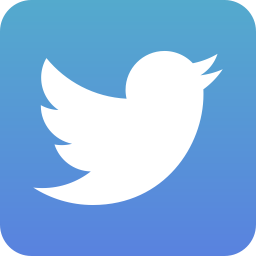 a blessing to all who come here. 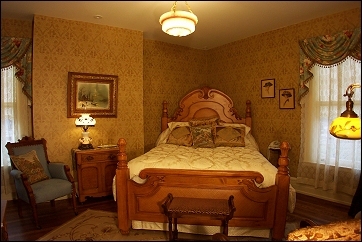 "- Jim & JoAnn M.
Originally this bedchamber would have been shared by two of the Hull sons, likely Henry and Richard. Today, it features a Victorian-style queen-sized bed, 1900's quarter sawn oak bonnet cupboard, Victorian armchairs and fireplace. The private bath, originally the servants' sewing room, includes a 2-person air-jetted whirlpool with separate shower. Originally this bedchamber would have been shared by two of the Hull sons, likely Gerald and William. Today it features an 1865 Victorian Renaissance Revival black walnut queen-sized bed and 1865 button-tufted demi-arm chairs from England, a fireplace, vintage draperies, and bedspread. A special feature of this room is a private balcony overlooking the historic neighborhood and, in particular, the mansion built by the owners' father, Henry Hull. This bedchamber includes a private vintage bath with the original pedestal tub w/shower and sink. Part of the original master suite, originally Mr. 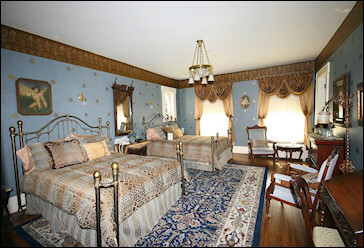 Hull's bedroom, this chamber features an 1850 Victorian Renaissance Revival 9-foot tall half-tester custom-sized bed, a fireplace and Louis XVI-style loveseat and chair. The vintage private bath includes a pedestal tub w/shower and sink. 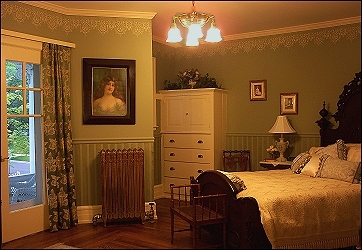 Part of the original master suite, originally Mrs. Hull's bedroom, this bed chamber features a fireplace, an 1880 Kingwood Napolean III queen-sized bed with heavily carved floral crest, an elegant Victorian armoire, loveseat, and chair. Also included is a private bath with oversized shower. Of particular interest is a discovery that was made during the restoration. After removing 5 layers of wallpaper, the original plaster revealed caricatures created by the original painters and paper hangers, autographed and dated 1908. This unique feature has been carefully sealed and remains as a tribute to the artisans that created the home. Originally Jane Hull's bedroom, this bright spacious room would have accommodated sizable furnishings and gave the young girl ample space to display an assortment of favorite collections. Today this authentically stenciled room features both a queen-sized and a full-sized Victorian style metal bed, a fireplace, a walnut Victorian desk and a pair of Eastlake velvet chairs. The vintage private bath features its original pedestal tub w/shower and sink. 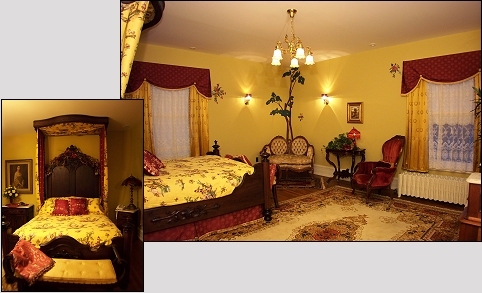 Originally the servants' quarters, this room has been converted into a lovely and romantic suite. This spacious suite is especially popular with our bridal and anniversary guests. 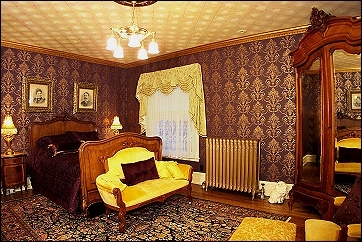 The 1890's Victorian Renaissance Revival bedroom suite features a queen-sized bed. Guests can relax by the fireplace in a comfortable sitting area that features a Louis XV revival sofa and fireside chairs. Or, when the weather invites us outdoors, they may enjoy their private balcony with a large sitting area overlooking the garden. The adjoining private bath includes an air-jetted 2-person whirlpool w/shower. 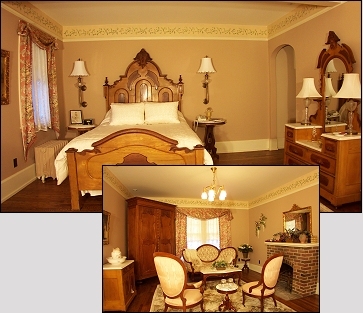 This 3rd-floor bedchamber of the hotel, originally a Hull family guest room, features a 1915 French-style bedroom suite with two full-sized beds, heavily carved Victorian velvet armchair with side chairs and a fireplace. 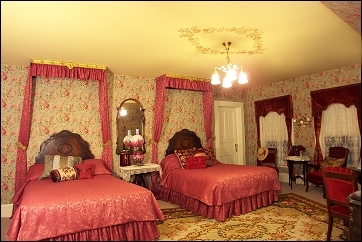 Antique cornice moldings were re-made and finished to adorn both beds, and antique draperies adorn the large windows. 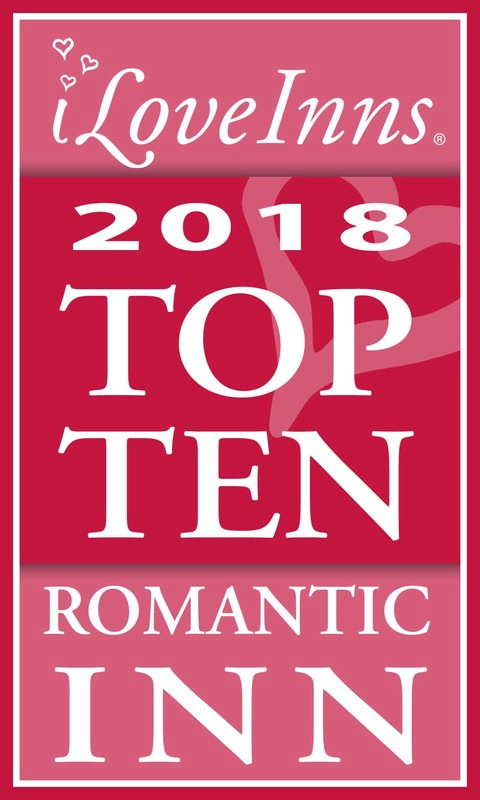 The adjoining private bath, with hand painted roses adorning the vanity and marble tile, includes a 2-person air-jetted whirlpool and separate shower. 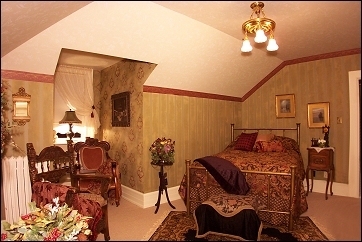 One of two guestrooms in the original Hull home, this 3rd-floor hide-away offered privacy away from the hustle and bustle of the family's activities. Today, this bed chamber features a fireplace, an 1880's Victorian Eastlake black walnut bedroom suite with queen-sized brass bed and heavily carved hall chairs. The morning sun spills through an accented dormer with arched window, creating a perfect reading area. The private vintage bathroom provides views of the bay and downtown area, and features a cast iron pedestal tub with unique "Worlds Fair Shower."